If you think that Tinkerbell won’t die if you believe hard enough in fairies, then you’ll have no problem believing this week’s tabloid stories, which rely heavily on wishful thinking. 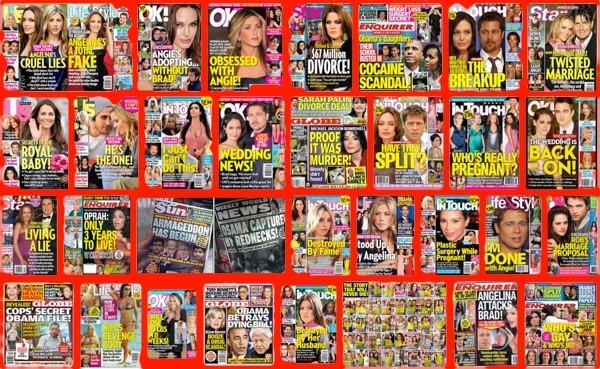 Princess-to-be Meghan Markle and disgraced NBC morning anchor Matt Lauer’s “dressing room hook-up” dominates the ‘National Enquirer’ cover, which reports that their “sleazy” rendezvous has left the “Royal wedding thrown into chaos!” An unnamed NBC source claims that Markle and Lauer disappeared into his dressing room and closed the door when she appeared on the ’Today’ show - twice! And what debauchery went on inside? The ‘Enquirer’ has no idea, admitting: “it went on behind closed doors.” But reporters can dream, can’t they? Sleazy, indeed. The ‘Enquirer’ also brings us the “Bruce Willis heart attack drama!” complete with “shocking photos” after the 62-year-old ‘Die Hard’ star allegedly “collapsed” while running on the set of his latest movie. How severe was his heart attack? Not at all, since it wasn’t a heart attack - but “people were terrified that he had a heart attack,” claims a source. Or maybe he just pulled a leg muscle, or sprained an ankle while running? Why let the facts get in the way of a good story? Cameron Diaz is “pregnant at last - at 45” reports the ‘Enquirer,’ which bases its story not on a pregnancy test or ultrasound results, but the fact that the actress recently wore a shapeless billowy dress. Well, if that doesn’t prove she’s pregnant, what will? And the ‘Enquirer’ couldn’t resist its breaking news about the big story of the day: Lee Harvey Oswald’s assassin Jack Ruby. According to the ‘Enquirer,’ the “CIA faked Jack Ruby’s Death!” Ruby was allegedly a CIA spy, and also “one of the shooters who got JFK,” and despite reports of his “sudden death” in police custody in 1967, he was secretly whisked away to hide out in Mexico. This information allegedly comes from a CIA agent who died in 2000 - so we know it must be true. Former White House aide and TV's ‘Apprentice’ alumnus Omarosa Manigault has been bad-mouthing President Trump since recently departing the administration, and the ‘Globe’ devotes its cover to its report that “Omarosa Stabs Trump in Back!” But the ‘Globe’ doesn’t take that sort of treachery lying down. They ran her voice through a lie detector test - not even close to the accuracy of stress levels monitored by physical lie detector tests that are considered inadmissible in many U.S. courts - and concluded jubilantly: “Evil Omarosa Flunks Lie Test!” The machine detected "a large amount of stress” in her voice, therefore “she’s definitely not being truthful,” claims an analyst. Or maybe she’s just under immense stress after being fired by the White House and turning on her former boss? Prince Charles’ wife Camilla has cancelled a trip to Australia, reports the ‘Globe,’ allegedly because she is “hiding from secret son!” Simon Dorante-Day has long claimed that he is Prince Charles’s love child given up for adoption by Camilla 51 years ago. He’s been making this claim for years, with zero evidence, but the fact that the Royals won’t submit to his request for a DNA test is enough to keep the story alive. It’s just a shame that last week Kensington Palace announced that Camilla definitely would be joining Charles on his trip to the Gold Coast Commonwealth Games in April. Ah well, can’t win them all. The ‘National Examiner’ dives behind Palace doors with its blow-by-blow account of Prince Harry almost assaulting Camilla during an argument, ordering her to “stop bad-mouthing my bride!” One can only assume that the ‘Examiner’ team of psychics and seers has finally used their supernatural powers to astral-project themselves into Kensington Palace to capture this scene, which is told with the lurid delight of an E.L. James novel. 'Fifty Shades of Royal,’ maybe? Fortunately we have the crack investigative team at ‘Us’ magazine to tell us that Chloe Bennet wore it best, that Olympic skier Gus Kenworthy skipped eighth grade, and that former Olympic ice skater Tara Lipinski carries keys, a first aid kit and Havaianas in her Chanel bag. Shockingly, this week, the stars are not like us! In a rare break with a hallowed journalistic tradition, ‘Us’ magazine brings us photos of stars taking selfies, exercising, playing golf, cutting birthday cakes, cuddling babies, and wearing “rainbow bright” fashions - but they’re not like us this week, perhaps because ‘Us’ finally figured out that the stars never have been like us. They’re wealthy, they’re beautiful, and they are pursued relentlessly by the paparazzi who fill the pages of ‘Us’ and ‘People’ magazines. Forgive me if I take a moment to pat myself on the back for predicting earlier this month that Jennifer Aniston and Justin Theroux would file for divorce, based on their “happy family” spread in ‘People’ magazine - always a good predictor that a marriage is on its last legs. When notoriously private couples suddenly go public with their immensely happy, shiny lives, you can bet their world is falling apart. ‘Us’ devotes its cover to a look inside Jennifer Aniston’s “shattered world,” yet its reporters find that she is actually far from shattered - Jen and Justin reportedly spent half their marriage apart, and she has seen this split coming for months, so the divorce hardly comes as a shock. At least she has some pretty photos of her happy home to look back on. And let’s not forget that J.M. Barrie asked ‘Peter Pan’ audiences to give Tinkerbell the clap.